Meningitis is the inflammation of the meninges (the covering membranes of the brain and the spinal cord). Meningitis begins when a causative agent enters on the central nervous system through the blood, CSF, or through the mouth or nose. The invading organism will trigger an inflammatory response. The inflammation may cause increased intracranial pressure, disrupted blood supply, and possible thrombosis or rupture. 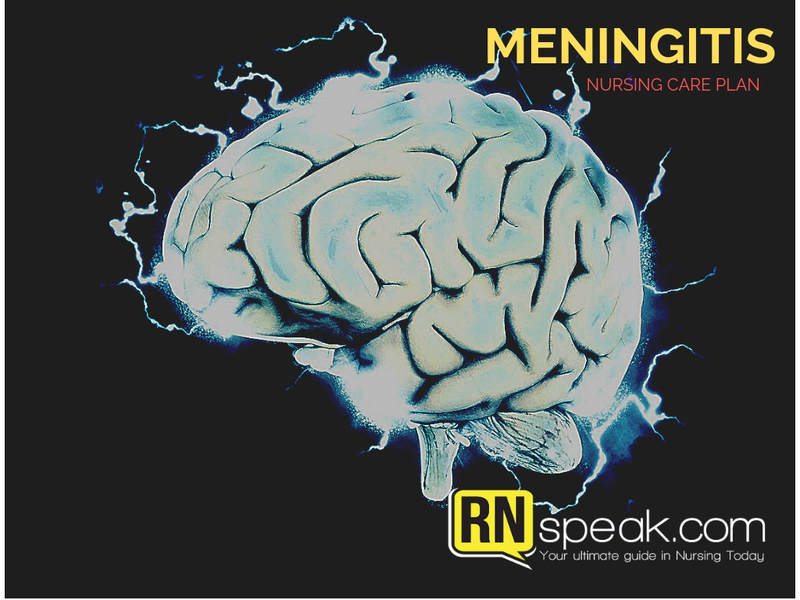 Bacterial meningitis is the most common form of meningitis and accounts for 80% of the adult cases caused by meningococcus, influenza bacillus, or pneumococcus. Viral meningitis usually occurs as a complication of a viral infection such as measles, chicken pox, or rubella. Transmission is through droplet or direct contract. Transmission occurs at crowded areas like college dormitories and prisons. The classic manifestations of meningitis are nuchal rigidity, deep tendon reflex hyperactivity, positive Brudzinki sign, positive Kernig sign, and opisthotonos (spasm of the muscles causing backward arching of the head, neck, and spine). Kernig’s sign is performed while the patient is in supine position with knees and legs flexed. If extended and the patient is not able to straighten the leg, the patient is positive for Kernig’s sign. Brudzinki sign is elicited by placing the patient in supine position. The examiner places one hand behind the patient’s head and places the other hand on the patient’s chest. The examiner will raise patient’s head while the hand on the chest restrains the patient and prevents the patient from rising. Flexion of the patient’s lower extremities (hips and knees) is a positive sign for meningitis. Brudzinki is more sensitive than Kernig’s sign.